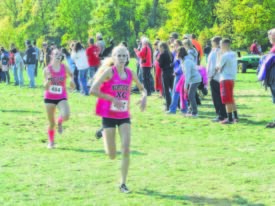 MARION — The Galion Tigers and Northmor Golden Knights cross country teams went to Marion Harding High School to compete for Mid-Ohio Athletic Conference honors on Saturday Oct.15. This was to be the final race before teams compete in Districts competition on Saturday Oct.22. The girls cross country team from Northmor are the 2016 MOAC Blue Division champions. The individual race winner, Emilie Schworm from East Knox, finished in a time of 18:42.3. There were many runners from the Knights that won all-conference honors on Saturday. Kristen Duryea was the top finisher for Northmor, finishing in fourth place with a time of 20:10.2. Jessica Duryea finished in 20:17.3 which was good enough for fifth place. Samantha Peters crossed the finish line in 20:17.7 to snag sixth place. Duryea, Duryea and Peters all earned themselves first team all-conference honors. Earning second team all-conference spots for the Knights were Maddie Jordan and Julianna Ditullio. Jordan finished in 12th place in a time of 20:45.3 and Ditullio in 13th place with a time of 20:51.1. Maria Lee finished in 16th place for the meet in a time of 21:23.3 to snag all-conference honorable mention honors. Other runners for the Knights’ girls team were: Brooke Bennett (23rd), Brooke Huntsman (31st), Samantha Grogg (34th) and Sabrina Kelley (35th). The boys team from Northmor finished third overall in the field of eight teams. Austin Hallabin from Mount Gilead won the event in a time of 16:00.2. Mount Gilead was also the MOAC Blue boys team champion for 2016. AJ White was the top finisher for the Knights on the day. White finished the race in 17:26.7 which landed him 10th place and second team all-conference honors. Also making the conference second team was James Walker. Walker finished in 14th place and crossed the finish line in a time of 17:44.5. Mostyn Evans finished with a time of 17:50.0 which was 16th for the meet. Ryan Bentley was right behind Evans in 17th place in a time of 17:50.6. Rounding out the all-conference honorable mention winners was BJ White, finishing in 21st place with a time of 17:55.6. Other runners for the Northmor boys were: Alec Moore (39th), Kaleb Hart (40th), Manny Heilman (41st), Kyle Price (49th) and Austin Amens (59th). The Galion Tigers girls finished in sixth place out of six teams in the Red Division 5k run. The individual winner of the race was Aziza Ayoub from Jonathon Alder in a time of 19:19.9. Buckeye Valley was crowned the team MOAC Red champion. Sari Conner was the top finisher for the Galion girls, crossing the finish line in 22:17.2, good enough for 13th overall. With the finish, Conner earned second team all-conference honors. Theresa House finished 17th in the meet at 22:59.9 and homecoming queen Megan Zier was right behind House in 18th place, finishing in 23:10.6. By placing in the top 21 of the event, House and Zier earned all-conference honorable mention status. Other runners for Galion were: Ashlie Sallee (33rd), Murissa Windbigler (34th), Lauren Huggins (36th), Abby Barre (43rd), Kelsey Hoffman (45th), Harmony Lohr (48th) and Cheyenne Blair (52nd). Galion’s boys team finished the day in fifth place of seven teams competing in the 5k run. The individual winner for the boys was Zach Kreft of Buckeye Valley. Kreft crossed the finish line in 16:09.3. Buckeye Valley was also the winner of the team MOAC Red championship. Braxton Tate was the top-placing runner for the Tigers on Saturday. Tate finished the race in 17:27.5 which was good enough for 13th place and second team all-conference honors. Lucas Conner landed all-conference honorable mention honors with hs 19th place finish in a time of 18:09.2. Other runners for the boys squard were: Luke Eisnaugle (24th), Spencer Guinther (30th), Weston Rose (31st), Colin McCullough (41st), Garret Murphy (43rd), Mikey Stover (44th), Kurt Ensman (46th) and Brendon Ganshorn (47th).